The creative workshops during the Craft Scotland Summer Show 2018. Bring your favourite jumper back to life with creative visible mending. 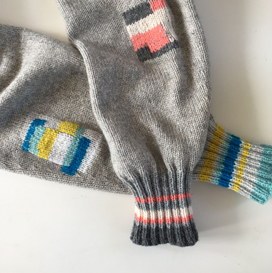 Flora Collingwood-Norris will guide you through the basics of darning, swiss darning and decorative embroidery stitches. Founder of her eponymous label Collingwood-Norris, Flora designs and makes colourful luxury knitwear, using traditional skills and manufacturing techniques to create accessories for men and women. Materials and refreshments provided. £40 per person, 12 places per workshop. 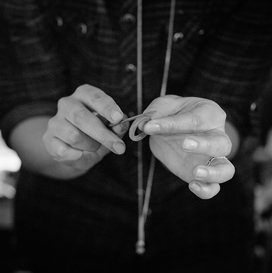 Carve your own ring in jeweller's wax. Get creative and make your own piece of unique jewellery to add to your own collection or gift to someone else. After the workshop, your piece will be cast in silver, professionally finished and posted back to you in 2-3 weeks. Included in the class will be the wax, use of professional jeweller's tools, expert tuition and your finished silver cast. Materials and refreshments provided. Free collection and UK postage, postage out with the UK will incur additional cost payable on the day. £80 per person, 10 places per workshop. 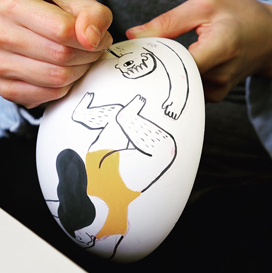 Illustrate your own design on a ceramic vessel. Ceramicist Natalie J Wood will guide you through creating designs, spacing, and using underglaze. After the workshop, your piece will be kiln-fired and will be back in your hands in one week. Natalie J Wood is a ceramic designer/maker. She believes in simple objects that are both decorative and functional. Natalie enhances the minimal objects she creates with a playful and experimental approach to colour. All materials and refreshments provided. Make a mosaic with ceramic and glass tiles. Mosaic artist Helen Miles will guide you through the direct mesh method, basic cutting methods and adhesion/grouting methods. All materials and refreshments provided. Helen Miles is a mosaic artist who has a reputation for finely executed pieces inspired by ancient mosaics but with a contemporary feel. 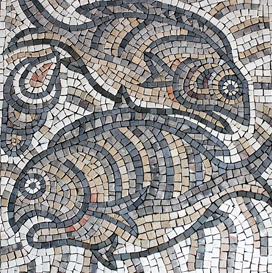 Helen studied the art of mosaics with master craftsmen in Greece and specialises in using marble and stone. £55 per person, 8 places per workshop. 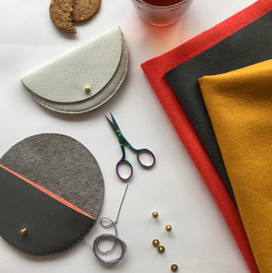 Sew a coin purse by selecting soft leather and pure wool felt in contrasting colours. Maker Jude Gove will guide you through cutting and hand sewing techniques. Jude creates handmade leather accessories in exquisite colour combinations and high-quality materials. All materials and refreshments provided. £35 per person, 12 spaces. Learn to carve a wooden spoon from sustainably sourced Scottish greenwood using traditional hand tools and techniques. 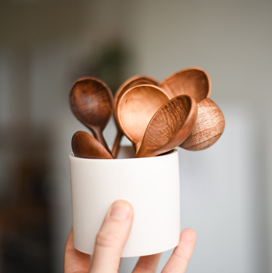 Taught by designer/maker Catherine from Object Company, a brand known for their handcrafted minimal wooden homeware. Catherine will guide you through knife skills and how to source wood, as well as finishing and treatment options. Materials and refreshments provided.